Yup, that's me (on the left), and no, I didn't do this with Photoshop. 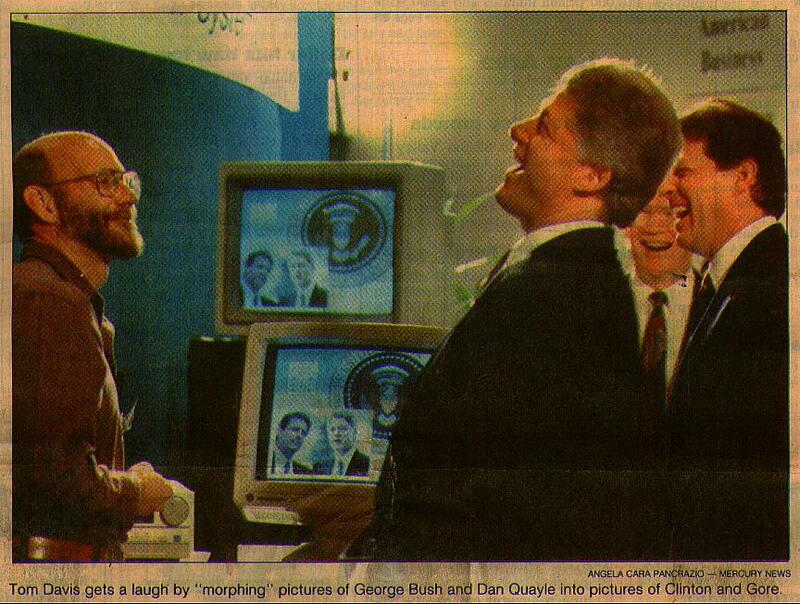 It's a photo from the San Jose Mercury when Bill and Al visited Silicon Graphics a few years ago. In spite of the fact that I obviously impressed them greatly, I have not yet received an invitation to sleep in the Lincoln bedroom. But I still wait by the phone every day, hoping they'll call. Thanks to the encouragement I gave him at this meeting, Al finally amounted to something and won an Emmy, an Oscar, and the Nobel Peace Prize. That's me again (on the left). I don't even remember why he was there, but Stephen Hawking came to visit Silicon Graphics and I scammed an invitation to the meeting. 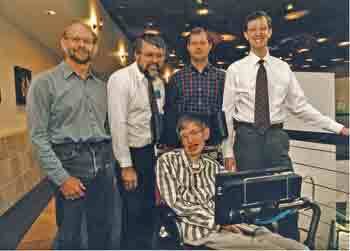 Standing behind Hawking, from left to right are me, John Mashey, Dave Orton and Kurt Akeley. I was a principal scientist at Silicon Graphics. Now I'm on a leave of absence (probably permanent), so there's not much on this page having to do with computer graphics; it concerns only my money losing interests. There are some interesting documents from my career at SGI that are worth including. Two were world-famous for a short time, and are still worth reading. Free dynamic geometry software for Windows or Mac: Geometer Software. I've written a program to help solve and learn about Rubik's cube. It currently runs on a PC or a Mac with OS X. Go to my Rubik's Cube Page to download the program and/or documentation. Here is a program to let you play John Conway's game of Hackenbush against the computer. It runs on Intel-based Macintoshes or Windows. Click here for more information. I have taken many photos of birds from all over the world and this page is an index to those photos, where the birds are organized in evolutionary order. The main page points to sub pages that contain, again in phylogenetic order, particular orders of birds. Photos and trip report from a trip to Thailand (in 2010). Preliminary page with bird images taken on a recent trip to Brazil (in 2006). Bird photos from a trip to Brazil in 2005. Photos a trip to Belize and the Florida Everglades, 2005. Bird images taken at the Palo Alto Baylands with a Nikon D2x. Photos from Bodie, a ghost town near the California/Nevada border, and from Mono Lake. Here are some ideas I have to improve the mathematics curriculum in secondary schools. Comments are welcome! For what it's worth, I wrote some code to solve the soma cube and the pentaminos puzzle by brute force. Here's a page from which you can download the C source code. Here are some notes about what I eat. I've been quite happy with the results, and I've been following this diet since December of 2003. Your mileage may vary! To help put off senility, I've been trying to learn foreign languages for the past few years. So far I've worked on Spanish and Italian. Here is a somewhat serious document with some suggestions for learning a foreign language (specifically Italian), and you can view an Acrobat version of that document here: learn.pdf or the PostScript version here: learn.ps. A number of people have found it to be useful; perhaps it will also be useful for you. I do a lot of triathlon, running and cycling. Here are a few reports written about some of the more interesting events. Here's the story of Burning Man, 2002. Here's a page with our Burning Man, 2002, art project: The Octavepus. The Burning Man Ultramarathon, 2010.